For working with LCD it is necessary to have Microprocessor. 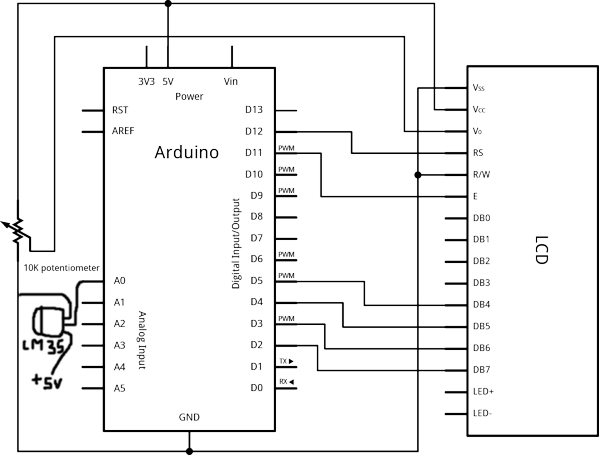 We have used Arduino Controller Board, which is AN OPEN-SOURCE ELECTRONICS PROTOTYPING PLATFORM. Output of Micro-controller is connected to the 16X2 LCD, Data is Processed by the C Program. For easy connection and Preset soldering I recommend use of PCB. which is shown below. You can save this for printing on copper clad Board. You can make your own PCB by Heat Transfer method or by screen printing method otherwise use Dot Matrix Board or Bread Board. This PCB will help you in all projects which used 16X2 LCD by reducing LCD Pin from 16 to 8 for easy connection. 0 Response to "Temperature Measure On Display"